While the obvious knitting tools of the trade are your yarn and needles there are so many other little devices out there. There are usually functional plain versions of these items but often there are funkier or funnier versions of the same thing. Case in point being the tape measure. Sure you could have a boring one but there are some pretty adorable tape measures out there, like the black sheep, or the Pinocchio. Some items are real necessities but other gadgets just make your knitting run a little smoother, these are the items I simply must have in my knitting kit. First up is the all powerful tape measure. This one is definitely a must have. 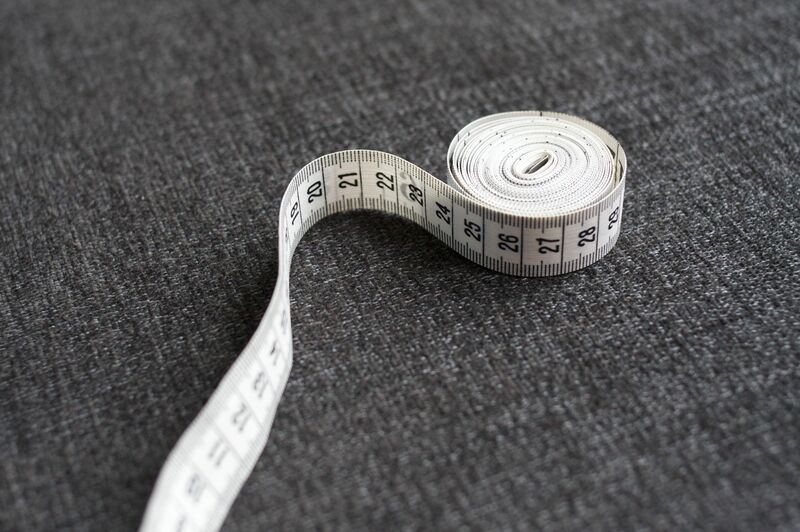 While many of us hate to swatch it doesn’t mean we don’t have to do it and a tape measure is the only way you are going to know if you are on gauge or not. Patterns also often include instructions that read ‘knit until piece measures __ inches’ (or something to that effect) and you just won’t know unless you measure! Next up is the stitch marker. This one really makes life so much easier. 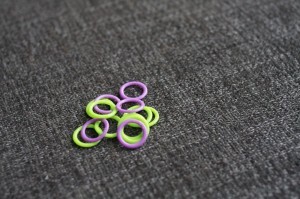 While it may appear to be ‘just’ a little plastic ring, it is a very important plastic ring! When you are knitting in the round you can slip one of these suckers onto your circular needle and you won’t have to think about the beginning of the round again. 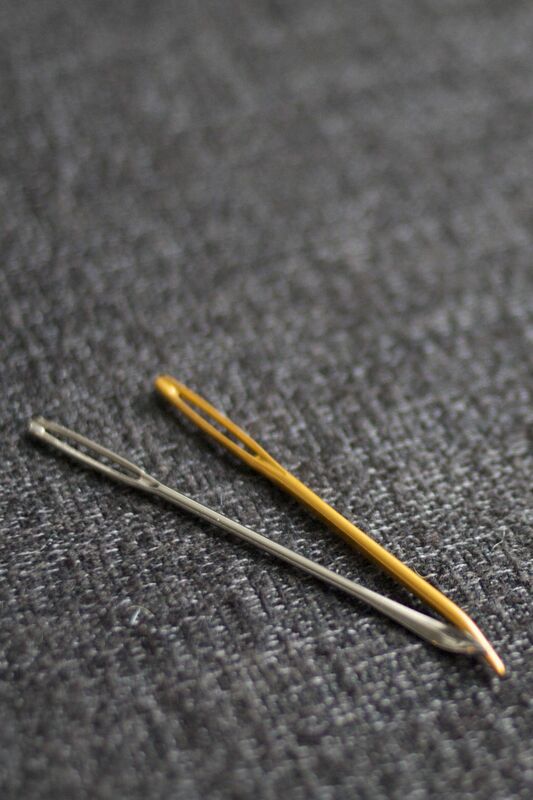 If you are using double pointed needles I recommend placing the stitch marker in the middle of needle one. The first stitch on needle one is the beginning of the round, but if you try to put a stitch marker on the end of a double point it will just fall off, thus marking nothing. Stitch marker are also great for marking the beginning and end of a pattern repeat. I have found this particularly useful when knitting lace, if you place a marker at the end of each pattern repeat you will know immediately if something has gone wrong, instead of waiting for the middle or end of a row, or *gasp* 2 rows later. These are really just a few uses, stitch markers really are an invaluable item. Last but not least on my ‘can’t do without’ list is a set of darning or tapestry needles. 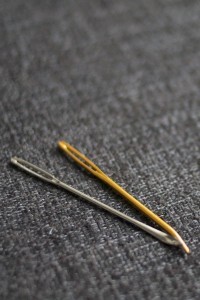 This is a blunt needle with a curve at the end and it is used for sewing up seams or weaving in ends. There is some debate on what the very best needles is for knitterly purposes, some think a sharper needle is ideal because you can split your stitches when you are weaving in ends, making it harder for those ends to come undone. I really think a dull needle is the only way to go though, it’s so much simpler to just weave the yarn through the stitch and it makes seams a snap. To each their own though, there is no right or wrong, only preference. So, if your knit kit is short any of these items I suggest you make your knitterly life a little easier by picking them up! This entry was posted on Thursday, February 3rd, 2011 at 11:44 pm	and is filed under Uncategorized. You can follow any responses to this entry through the RSS 2.0 feed. Both comments and pings are currently closed.